Looking for a vehicle with one of the top fuel-efficiency ratings among SUV configurations? The all-new 2018 Ford EcoSport starts at $19,995 MSRP, and you can find with a couple of different engine and drivetrain options near Eagle right now. Check out the EPA estimates of the new Ford EcoSport with the team at Glenwood Springs Ford right now! The standard engine is a turbo 1.0L 3-cylinder engine that generates 123 hp and 125 lb-ft of torque while towing up to 1,400 pounds. It comes with FWD. On each of these three trims, the 2018 Ford EcoSport gets an EPA-estimated 29 mpg highway/27 mpg city. Opt for the available SES trim for a boost in performance and you’ll still get an EPA-estimated 29 mpg highway/23 mpg city. The Ford EcoSport fuel savings don’t stop there. Improve city fuel economy with Auto Start-Stop system, which automatically turns the vehicle off while idling and reengages the engine as soon as you hit the gas. If you would prefer, you’re also free to turn off Auto Start-Stop at any time. 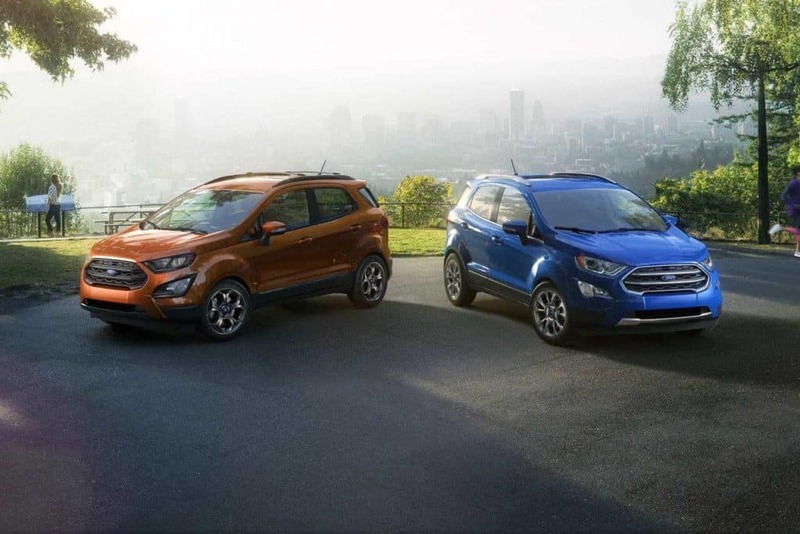 S, SE, and Titanium Performance: The standard engine on the Ford EcoSport is a turbocharged 1.0L 3-cylinder engine that generates 123 hp and 125 lb-ft of torque while towing up to 1,400 pounds. It comes standard with front-wheel drive. SES Performance: Drivers looking for more power under the hood have access to the SES trim, which comes with a 2.0L 4-cylinder engine with an Intelligent 4WD drivetrain system. It makes 166 hp and 149 lb-ft of torque, and allows the EcoSport to tow up to 2,000 pounds. If you’re looking for a great deal on a new and fuel-efficient family vehicle, then make your way from Rifle to check out the new Ford EcoSport at Glenwood Springs Ford, located at 55 Storm King Rd in Glenwood Springs, CO. We have a lot of Ford offers and incentives going on now, and you can reach us directly at 970-945-2317.